At the Sourlands Mountain Preserve on East Mountain Road in Hillsborough, three trails begin at the same Trail Head across the grass from the parking lot. 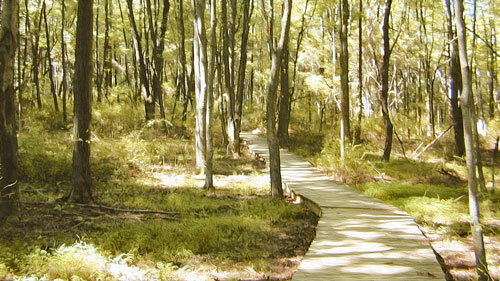 Grab a map in the kiosk and enter the woods for this pleasant hike in Somerset County. Take the four-mile Ridge Trail, designated with a rectangular blaze. The blazes here are carved wooden plaques in geometric shapes. Walks are always easy at the trailhead, and this one starts with a smooth gravel/dirt path under tall trees. The Ridge Trail is a gentle climb for about a mile with winding walks on flat terraces interspersed between rises. The sunny path is wide through ferns, berries and spicebush, and a boardwalk covers an outwash of weathered and crumbled rock. There are no big boulders to rest on this trail until almost at the top. A rocky-bottom brook begins shallow and flows to a deep-cut streambed. Tall skinny beech, oaks and tulip poplars comprise a mixed oak forest here and cover the flattish hilltop and slopes. The trail crosses the Texas Eastern Pipeline, offering an open, sunny habitat with abundant wildflowers and tall patches of Phragmites. For a great view on a clear day, follow the pipeline uphill, have lunch, then come back down to the rectangular blazed trail that re-enters the woods. The path eases down the hill through grassy, open woods where thick Virginia creeper vines hang from the trees. The Boy Scouts built a handrail to assist hikers on the trail's steepest descent. At the bottom of the handrail, a wide flat boulder---conveniently located---is a great place to stop, rest, and have a snack. 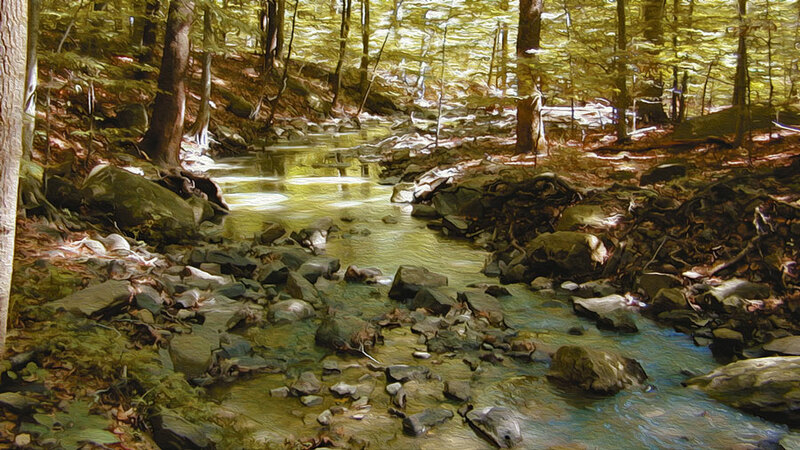 Further down, the Roaring Brook flows with a comforting sound, even in dry times. It eventually empties into the Millstone. On the final stretch, the trail crosses a gentle slope through towering deciduous trees that have shaded out a broad patch of old Eastern red cedars. Sourland Mountain is a 10-mile long volcanic ridge of diabase--one of six in the Central Jersey lowland. Large boulders here were crushed for railroad beds, roofing shingles, and road surfaces. 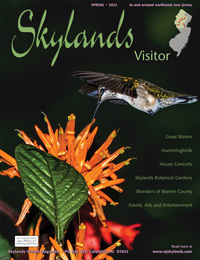 Its diverse landscape provides habitats for a variety of wildlife and plants. Rare plants found here include wild comfrey, winged monkey flower and ginseng. Threatened and endangered wildlife seen here include the grasshopper sparrow and barred owl. Over 30,000 people a year, including birders, hikers and families out for a fun day, visit the Preserve. The Sourlands mark the southern boundary of many northern bird species, and the northern boundary of southern species such as the black-capped and Carolina chickadees. Birders know it and come here all the time. Bring binoculars and a bird field guide. There's an active pond near the parking lot and grassy picnic areas. On the 2,600-acre preserve, there are three trails, two about a half-mile each. The Ridge Trail is a pleasant moderate walk through bright sunlit woods on wide paths. Mountain bikes and horses are allowed in season. 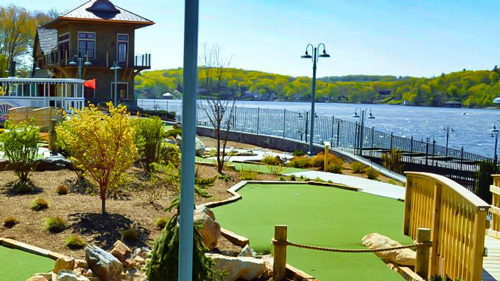 Two hundred seventy three acres of the mountain extend into Hunterdon County and is under the jurisdiction of the Department of Parks and Recreation. There are two trails for public use ­ a wide, flat service road that goes through deciduous woods, a marsh and a boulder field of diabase or "trap rock." The marsh is a perched wetland, a depression in impermeable rock, and filled by surface water. The South Loop Trail branches off the service road, becoming very wet and even crosses a stream. Be prepared to boulder-hop. The reward is a plethora of native wildflowers. Vernal pools provide great amphibian watching. See if you can find spotted salamanders, wood frogs, and gray tree frogs. To get there: Rt. 206 to Amwell Road in Hillsborough. Turn left onto East Mountain Road. The parking lot is 0.6 mile south. Or, take Rt. 601 to East Mountain Road. For more information, contact Somerset County Park Commission at 908-722-1200 or mail to PO Box 5327, North Branch, NJ 08876. In Hunterdon, call Department of Parks and Recreation at 908-788-1158, or write to PO Box 2900, Flemington, NJ 08822-2900.